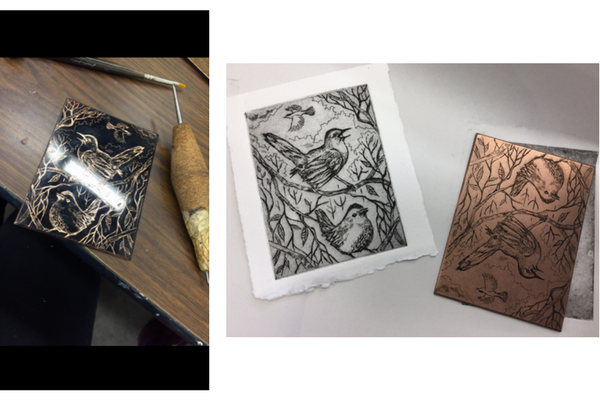 “Printmaking 101”… a blog post for those who are interested in a very introductory explanation of printmaking. Hopefully, while I intend to be simple and brief, you will also learn enough to be able to purchase a print and know what you are buying and what went into the making of it. The first dictionary definition I pulled up for “Printmaking “ said: “the art or technique of making prints, especially as practiced in engraving, etching, drypoint, woodcut or seriography.” This very definition calls to mind the reason that some of us are so confused about printmaking. The fact is that there are so many methods for making prints that it is challenging to keep track of them all! Even as an avid fan of printmaking, I often encounter print mediums that are new to me. It may simplify matters to understand that many types of printmaking techniques can be placed into one of two categories, these being Intaglio or relief. For the most part, prints are made by creating an impression from an image that the artist creates on a “plate”. Relief prints are made when the negative space is cut away in the plate, and the image is made by inking the highest part of the plate, which is left when another portion has been cut away. The ink is applied to the plate using a roller, and the image can be transferred to the paper by means of a press or even by apply pressure on the back of the paper using a wooden spoon or barren. On the left is a picture of two different relief plates. The top one is a woodcut and the other is carved into cork. You can see the ink has stained the highest level of the plates. On the right is a picture of an artist inking a linoleum cut before printing it. Examples of relief prints are woodcuts, wood engraving, linoleum cuts or linocuts. In order to make multiple colors on a plate, printers will make an edition and after making all of their copies in one color, they cut away more of the plate and then print over the edition in a new color. This is called reductive relief. The opposite of a relief print is an Intaglio print. Engraving, etching and drypoint are examples of Intaglio prints. Intaglio plates can be made of various metals, copper being very popular, or plexiglass. An Intaglio plate is inked by scraping ink into the grooves that are created in the Etching process with a small piece of cardboard or similar substance. Excess ink is then buffed off of the plate before running it through a Press with the moistened paper. The image is created by making an impression of the ink that is in the lowest part of the plate. These photos show a copper plate etching (left) in the stage where the artist uses an etching needle to draw into the plate. After the plate has been etched with acid, it is ready to print on the press. (right) There are other chemical processes that can be used to enhance the image by creating textures on the plate, such as aquatint or sugar lift. A drypoint etching refers to one that is made without using chemicals to deepen the lines, and can be done on a metal or plexiglass plate. While there are examples of other kinds of prints that don’t fall into either of these categories, such as silk screen and monoprints, hopefully knowing this much will prepare you to ask the artist questions or at least have an idea of the process that went into the creation of the prints you see in a gallery or studio. In many cases the artist will have put as many or more hours into the creation of the image that is of comparable size to a painting you see, and the difference in the cost is that there will be multiple identical or very similar copies of the same image hanging on other people’s walls out there! Next up: a few rules of thumb for understanding the value of your print.